The fabled Master Chief, hero of Earth and legendary foe of the Covenant, is away without leave. Directly opposing orders to investigate a mysterious signal, it is up to Spartan Jameson Locke and Fireteam Osiris to find out where Master Chief has gone and bring him back. And so begins Halo’s first new foray onto the Xbox One. The twist of Master Chief going AWOL and pitting him up against the UNSC and Fireteam Osiris is an interesting, unexpected direction for Halo to go after the events of Halo 4. Sure, Halo 2 had its Arbiter missions and we’ve all played through ODST and Reach, but this time John-117 takes a major backseat to newly introduced protagonist Locke. The story still centers around Chief and his journey but the gameplay focuses almost entirely on Fireteam Osiris. You will control Master Chief and his Blue Team, but the levels are few and far between. Luckily the story and presentation are up to the task of delivering a solid story throughout the campaign. All of the characters are voiced well and give the epic story plenty of bravado and seriousness. The game is visually astounding, both from a technical and artistic aspect. There are several times where I was dropped into a new environment and just had to stop to take in how beautiful the world is. The cut-scenes feature gorgeous characters and perfect lip syncing, which surprisingly many games still struggle to achieve. The actual story of Master Chief and Locke is properly epic with a new, all-powerful terror set to endanger the entire galaxy. AI is a large focus of the game as the Prometheans, machine based constructs, seek to control a universe filled with organics. Familiar characters and locations return, such as Dr. Halsey, the Arbiter and UNSC flagship the Infinity, although there are plenty of new characters and environments to explore. The story of Halo 5: Guardians remains compelling all the way through to the end, although the game surprisingly grinds to a halt before the actual conflict is resolved. The immediate threat is stopped but a grander, far more dangerous future lies ahead which, unfortunately, will have to wait until the next title. One thing that is incredibly unexpected with Halo 5: Guardians is the removal of the Didact, the antagonist of Halo 4. While at the end of 4 the Didact was defeated, he is supposedly still out there, plotting his plan to turn organics into machines. It’s an odd omission, especially since the Didact’s ultimate goal seems to fall in line with the overall theme of the plot. Perhaps he, too, is something waiting for a future installment. Whether you’re fighting Prometheans or Covenant, Halo 5: Guardians is clearly a game focused on squads and, consequentially, cooperative play. 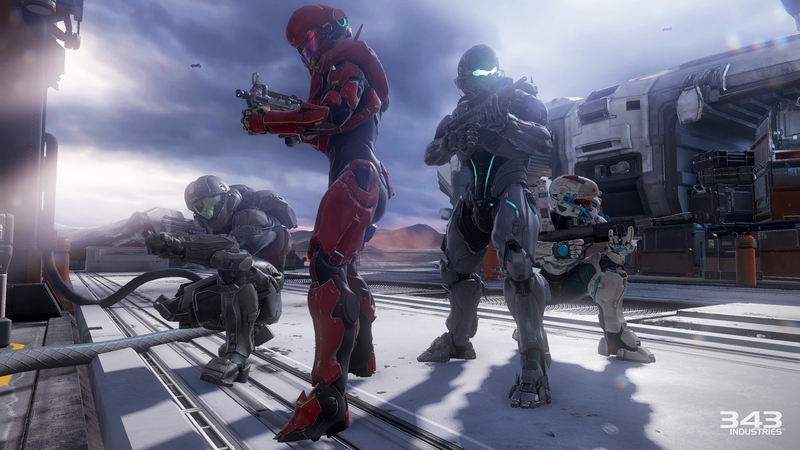 Both Chief and Locke are always accompanied by a team of Spartans. This leads to a significant change in the way Halo plays and feels. When killed you no longer die immediately. Instead you go into Gears of War-esque “down but not out” state where you can be revived by your teammates, whether AI controlled or human. The first time it happens feels incredibly unnatural for a Halo game and you never quite get used to it. It is nice to have that security blanket though; I found myself playing riskier and more dangerously knowing I could be revived if needed. Naturally you are the leader of your squad so when playing in single player you can direct your teammates. You can have them push forward to a specific area or target a specific enemy. Your teammates are fairly benign when left unsupervised but if you direct them they become quite effective. However, what starts out as just a clever way to assist you in taking out enemies slowly becomes crucial to completing the various sections of the game, included fights against Hunters and other enemies where the trick to killing them involves having your team distract them while you shoot them in the back. This squad-centric gameplay usually doesn’t become too much of a hindrance but as the game ramps up in scale and difficulty, it becomes more and more about babysitting your AI teammates. You can revive them if they go down but often times you will find they are standing out in the open or running forward into places with little to no cover. This all culminates with the final boss battle which becomes almost of comedy of errors as you watch the AI try to attack and/or avoid enemies that have one-hit kills, all while avoiding being one-hit killed yourself, all while also trying to somehow shoot these near invincible enemies in the back. Needless to say it’s a cycle of frustration. Outside of the squad mechanics, both Chief and Locke sport some abilities new to the Halo franchise. They have thrusters that let them do a quick dash to avoid danger, a new shoulder bash move that sends enemies flying or breaks through weak walls and new a ground smash attack that lets you come crashing down onto enemies while mid-air. These new abilities don’t really change things up too much in the campaign but they are fun little additions that have a greater impact in multiplayer. Spartans have also finally learned how to aim down the sights with all weapons now, with the ever important feature being mapped to the left trigger for the first time in the series. Halo still mixes up this idea by having aiming change the way several guns behave, almost as an alternate shooting mode. However, in a nod to classic Halo you still lose your sights if you take damage,and accuracy while shooting from the hip feels pretty much the same as aiming down the sights. Even with all of the changes to the squad and new abilities, Halo 5: Guardians still plays pretty much like a traditional Halo game, which is of course a good thing. Expect smart AI to fight against and enemies that require tactics to defeat beyond just shooting them in the head. Each mission is a sandbox to fight in with open areas, multiple levels of elevation and plenty of opportunity for strategy. Expect a fair mixture of on foot and vehicle combat with both smaller scale conflicts and massive battlefields. A wide range of weapons and limited ammunition for your UNSC weapons will have you constantly switching out guns for new ones and staying on your toes. It’s classic Halo gameplay and it’s still great. When the campaign is over and evil has been defeated (for now), that usually means it’s time to turn your gaze to Halo’s other massive draw. 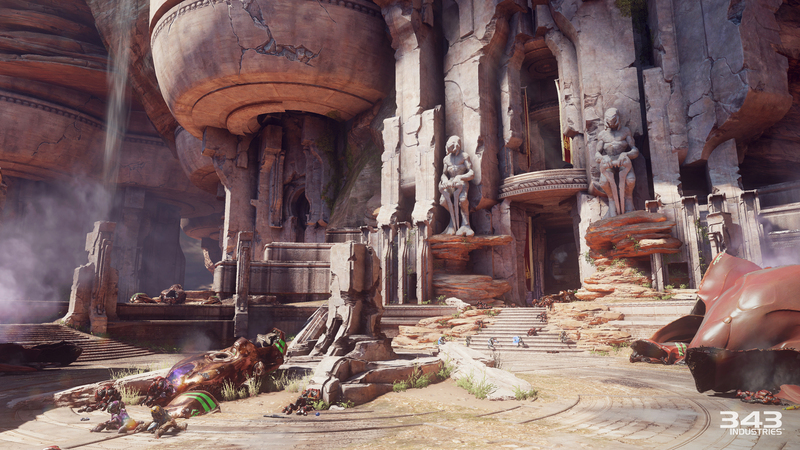 Competitive multiplayer is divided between two distinct categories this time around: Arena and Warzone. 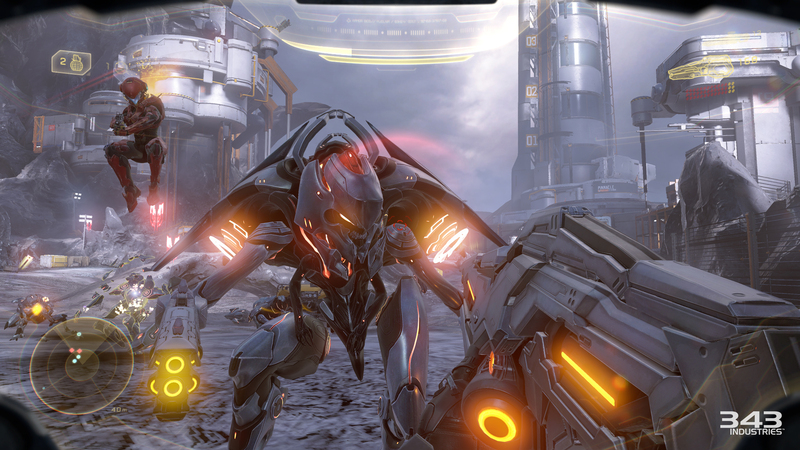 Arena is a set of game modes for traditional Halo combat. Mainstays like Slayer and Capture the Flag return with new modes like Breakout and Strongholds joining in the classic action. Halo 4’s Ordinance drops are gone, along with Reach’s armor abilities, as Halo 5 returns to a much more classic Halo experience that plays very well. Still, the new dash and sprinting speed up the gameplay considerably, which I found to be a welcome change. Arena’s classic feel is a great direction for the multiplayer to go for those looking for straight up competitive multiplayer. However, for those looking for something different, 343 Industries also has another trick up their sleeve with Warzone, a multiplayer mode unlike anything else. 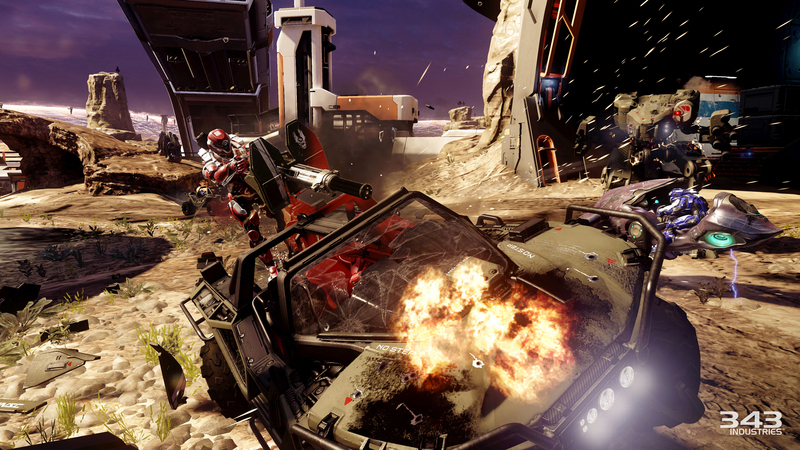 Where Arena is small, 4 on 4 action, Warzone is large-scale warfare for up to 24 players. Warzone takes Halo’s sandbox gameplay from the campaign and smashes it together with multiplayer to create an epic new gameplay type. The premise is simple: your team is dropped onto a massive map with the goal of accumulating 1000 points before the enemy does. You’ll accomplish this by killing enemy players and taking bases. However you will also be at war with AI controlled mobs on the map, similar to MOBAs. Killing certain VIP or legendary bosses will net your team a hefty amount of points. To take out these enemies and contend with the opposing Spartan forces, you’ll have to also take advantage of the game’s new Requisition system. To truly be successful in Warzone you need to call in better weapons than just your trusty assault rifle and pistol. Using REQ cards will let you take hold of heavy weapons, vehicles or armor abilities to help you wage war but be careful how you use them because these REQ cards are consumable items. 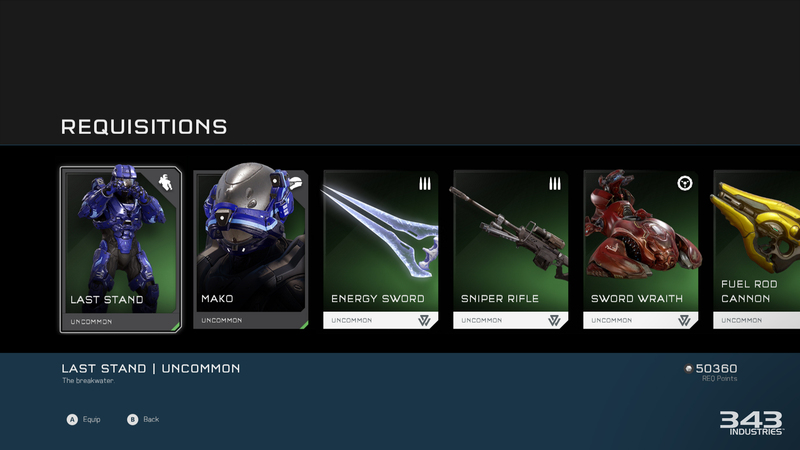 You only get these cards from REQ packs that you either earn through leveling up and completing commendations or you purchase using REQ points. That’s right, Halo 5 has taken a page out of EA’s book who found success with these packs in games like Mass Effect 3 and Plants vs Zombies: Garden Warfare. Similar to those games you purchase either a bronze, silver or gold tier pack with progressively higher chances for better REQ cards. Each pack comes with a healthy amount of cards including both permanent unlocks for standard abilities as well as the consumable cards. They even include your Spartan’s cosmetic customization options. It’s a system I can easily see becoming an addictive aspect of the game. Now before you get upset about this new system, there are two things you should know. The first is that, yes you can use real money to purchase these REQ packs but it most certainly doesn’t feel necessary. You get between 1200-2000 REQ points per match, including Arena games, and the gold REQ pack costs 10,000 points. You can easily see how quickly you can earn packs just through normal play. Secondly, the way Warzone is balanced seems like this REQ system can’t be abused by big spenders. Similar to MOBAs, you start at level 1 in Warzone and have to level up by killing enemies and completing objectives. You’re not going to be out there dropping tanks and rocket launchers in the first 30 seconds of match. When the REQ level does get up enough to use these high-powered REQs, there is a cooldown for calling in new REQs. The higher level the item you call in, the longer you’ll have to wait. The system seems fair and balanced to the point that you won’t have the enemy team steamrolling you just because they have more REQs than you or spent more money than you. The side effect of this REQ system and the micro-transactions that go along with it is that future DLC maps will be added to the game for free, meaning there won’t be the common shooter problem of splintering the player base between those who bought the DLC and those who didn’t. There are plenty of maps at launch with a healthy split between Arena and Warzone. Another aspect being added onto the game down the line is the popular Forge mode, which is set to be added in December. With new maps coming from both DLC and Forge, 343 Industries is set to have a well-supported game for a long time, as has been their history with Halo. Halo 5: Guardians is a game that seems brings both old and new ideas. On one hand you have traditional Halo gameplay, Master Chief and classic Halo multiplayer. On the other hand you have squad mechanics, a brand new protagonist and the ambitious Warzone multiplayer mode. As a fan of Halo, all of the classic stuff hits just the right notes and works well, but doesn’t quite do anything spectacular. However the new things that Halo attempts in the campaign seem to bog down an otherwise solid experience. They lead to frustration and annoyance far more often than not, which is terribly disappointing. The true gem in Halo 5: Guardians is Warzone, which breathes fresh life into the multiplayer that, while still really fun, needed something new to mix it up. Overall you have a mixed package with a campaign that is fun but filled with frustrating moments and a multiplayer that hits pretty much all of the right notes. A code for Halo 5: Guardians was provided to Pixel Related for review. Tags: 343 Industries, Halo 5. Bookmark the permalink.